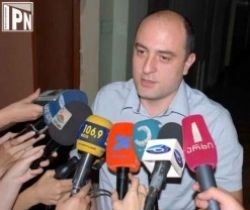 TBILISI, DFWatch — General Director of Georgia’s Public Broadcaster (GPB) Gia Chanturia has resigned. He handed in his resignation letter to the GPB’s supervisory board, which approved it today at a special session. Late Thursday night, there were unconfirmed reports in the media that Chanturia might leave. Friday morning, GPB announced that the supervisory board would meet to review his application. The board decided to approve the resignation and that technical director Giorgi Baratashvili should take over for Chanturia until a permanent replacement can be found. Chanturia told journalists after the meeting that he is resigning because he wasn’t able to fulfill the plan he made when assuming the post three years ago. He explained that there were problems with the structure reorganization of GPB and other issues, and that he decided to leave the arena to others. He said he will leave a realistic budget approved by the board. The General Director was appointed in 2008 for a six year term, and confirmed by the supervisory board, which will now have to announce a competition for the post of general director. After the parliamentary election was over, society started reviews about the necessity to change GPB director, and discussed possible new candidates. The Supervisory Board’s director says that the new general director should be elected no later than one month after the competition is announced.